Who says baseball cards can't have a sense of humor? 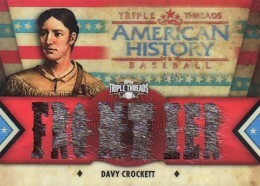 Davy Crockett, Daniel Boone and Casey Jones are all surprise relic inclusions in 2012 Topps Triple Threads Baseball.They fall under the banner American History. 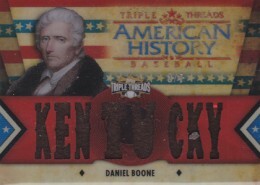 Numbered to 5 copies each, these cards were not included on the final checklist released by Topps. Topps confirmed these cards are bonus incremental hits in packs and do not count toward the promised relics. While this may make some eyes roll, especially after last year's similar John Henry card, it looks as though Topps is showing a lighter side with its disclaimer on the back of the card. 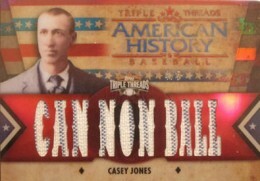 It reads, "This is a Topps Certified History Triple Relic Card From 2012 Topps Triple Treads Baseball. These Relics Are Not From Anything At All." So obviously that fur was not worn by the man who was born on a mountain top in Tennessee. Instead they're all included as something extra with a wink and a nudge. The first copies of the Boone and Jones cards listed on eBay each sold for $175 each. Chris Sale 2012 Topps Triple Threads Patch Autograph #20 75 Auto CY YOUNG? Chris Sale 2012 Topps Triple Threads Patch Autograph #47 99 Auto CY YOUNG? Cool, no different than any other Topps “relic” card…..
2012 Topps Triple Threads Baseball Sealed Box Straight Out of Hobby Box Case!